Memorable, hi-energy, fun, supportive and completely exhausting are just a couple of thoughts the ECHO and Lake Champlain Basin Program (LCBP) volunteer team shared at the end of a very long night of selling t-shirts and hoodies for the Phish Benefit Vermont Flood Recovery Concert. 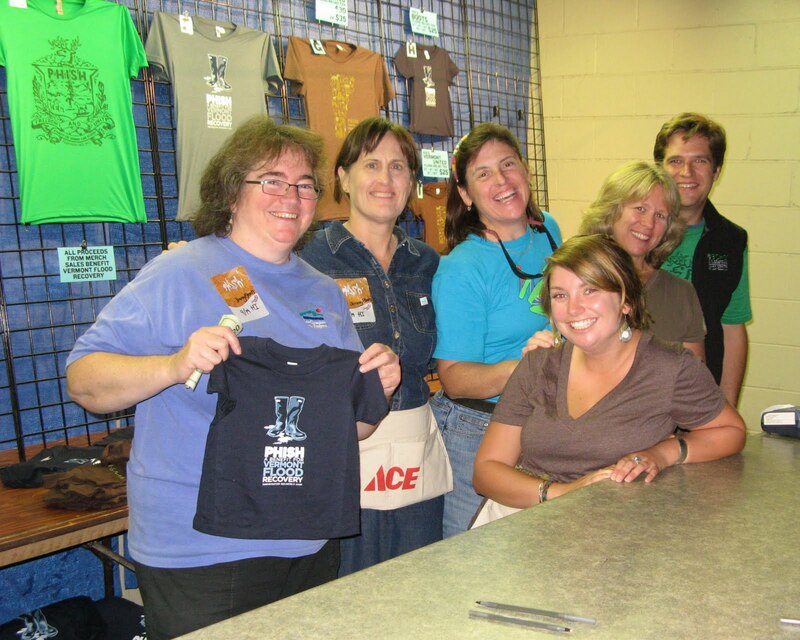 Jimmy and Brent were our Phish "Merch World" gurus that trained and organized our team of six (photo left): (left to right) Colleen Hickey, LCBP; Laura Hollowell, LCBP; Julie Silveman (Volunteer Team Organizer), ECHO; Emily Bird, LCBP; Elizabeth Nuckols, ECHO and Stephen Perkins, ECHO. ECHO and the LCBP were thrilled to be able to help The Waterwheel Foundation with this event since they do so much to support environmental causes all around the country and here at home, in the Lake Champlain Basin. 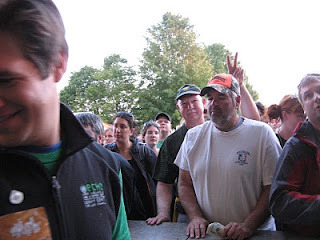 At 5:30PM on September 14, 2011 the doors opened to the The Champlain Valley Exposition for Phish fans to find their spot for the momentous event and buy Phish limited edition Flood Recovery posters, t-shirts and hoodies. And buy they did! As Steve (photo right) said, "I've been to concerts similar to this in the past and was blown-away by the constant crush of people at the retail booth." It was obvious by their enthusiasm, fans were so happy to have Phish back home and they were psyched to be able to contribute to such an important cause. Our merry band of t-shirt slingers were all thanked countless times by concert-goers for volunteering and helping out. Even the few disappointed late comers that went away without their first choice t-shirt design were happy just to participate and take home a piece of the vibe. According to the Burlington Free Press the benefit concert raised more than $1.2 million for Vermont flood recovery, that's $200,000 more than the band was hoping to raise. It feels great to volunteer and contribute to the effort. Our little band of "Merch" volunteers and staff raised about $80,000 for our Vermont neighbors. In between the selling frenzies, we were able to grab a couple of minutes of the show--which was fantastic and felt surprisingly intimate for a 12,000 person audience. It must have been all of the good karma. It has been a really tough year for so many Vermonters affected by the record setting spring and August floods. Who knew we would break high-water records for so many Vermont rivers and Lake Champlain? We could not have predicted the one-two punch of natural disasters that slammed Vermont this year. What is predictable, and what we've always known in our heart-of-hearts, is that Vermonters always pitch in and help others in need. Never a doubt. For more photos visit ECHO's Facebook album.